THON has been a big part of my life since my freshman year. I was so greatly touched by the community that THON fosters and how THON unites others in helping to provide unparalleled year-round support to every Four Diamonds Family. In addition, THON provides an immense amount of hope; hope that a family going through cancer treatment will never have to see a hospital bill; hope that a child suffering can look forward to seeing the BJC packed with their biggest supporters; hope that one day cancer won’t carry the deafening, earth-shattering meaning it does today and a family will no longer have to fear the words: “Your child has cancer.” And, above all else, hope that one day all new families of THON will defeat childhood cancer. I wanted to be a member of the Executive Committee so that I could have the opportunity to unite with the rest of the THON community to carry on the mission of THON as we fight childhood cancer in search of a cure. 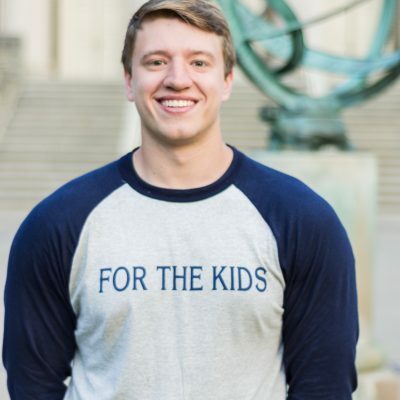 I want to help find innovative ways to continue to provide the best support possible to all families and volunteers, continue to foster a united THON community, and do whatever I can to help ensure that THON is no longer a dance marathon to conqueror childhood cancer, but rather a dance marathon to celebrate conquering childhood cancer. What are your main duties as the Special Events Director for THON 2019? As the Special Events Director, I work closely with all members of the Executive Committee and the Special Events Committee to support THON's mission of providing the best year-round support to all Four Diamonds Families. The Special Events Committee aims to inspire, inform, and unite the THON Community by developing and continuing a variety of events to spread the spirit of THON year-round. The Special Events Committee is responsible planning and executing all Penn State THON Athletic Events, THON 5K, 100 Days 'Til THON Celebration, Family Carnival, Road to THON Celebration, The THON Showcase, all Hair Donation events, the parking logistics for all events and THON Weekend, THON History, THON Dodgeball, THON Skate, Athlete Hour, and Alternative Committee Events during THON Weekend. My favorite THON memory is from THON 2018 when I was a Family Relations Captain. I had the privilege of attending the Hershey Fashion Show, which is a small fashion show that THON plans for the kids at the Penn State Children’s Hospital. During this fashion show, I got to witness a 5 year old girl, who was actively going through treatment, hold hands with her dad and dance on the red carpet while everyone at the event watched. After the song ended, she kissed her dad on the cheek, gave him a hug, and said “I love you, daddy.” This moment was so touching, and is one that I recall so vividly. This father and daughter were able to share this special, happy, pure, and genuine moment in the midst of a battle with an ugly disease. I think this moment provided such an outstanding display of one thing that THON aims to provide to countless kids and families: a safe place away from the horrors of childhood cancer.